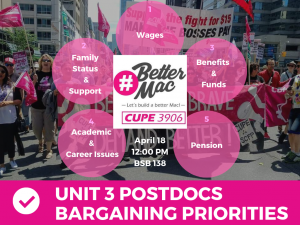 We wanted to remind all Postdocs of your Bargaining Priorities Ratification meeting, taking place on Thursday April 18th at noon in BSB 138. 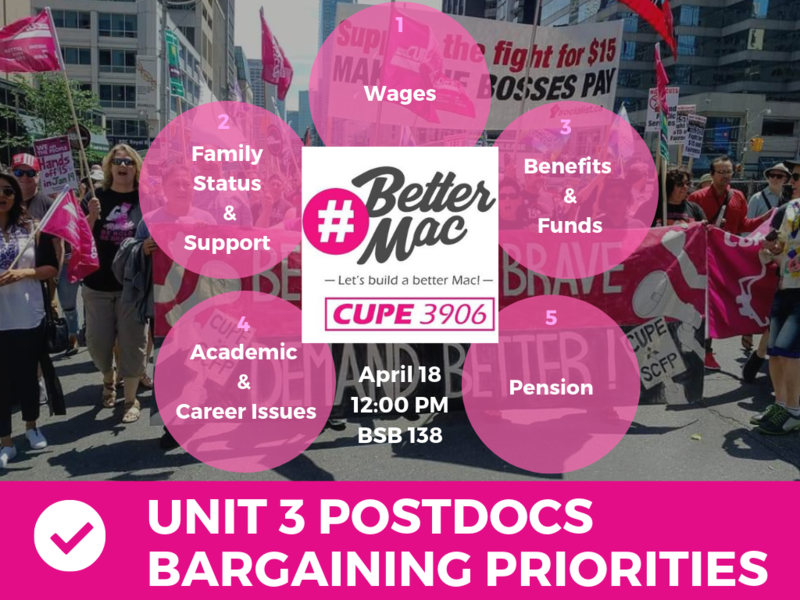 After reviewing the survey results, the bargaining team has seen that you’ve identified some major priority areas for a #BetterMac. Thursday’s meeting gives the membership a chance to ratify your priorities before we meet with the Employer at the bargaining table. The major priorities coming out of the survey are: wages, family support, improved benefits, strengthened professional development, and access to a workplace pension. Please take a moment to click on this Eventbrite link to confirm your attendance so we have a better sense of numbers for ordering food. We’ll have lunch at the event, and will be sure to include halal, vegan, and gluten free options. The building is accessible and childcare costs involved with facilitating your attendance will be reimbursed.